Every morning after a good breakfast has been eaten by all and the sticky is wiped off of all 20 fingers and 2 button noses we have our morning devotions. 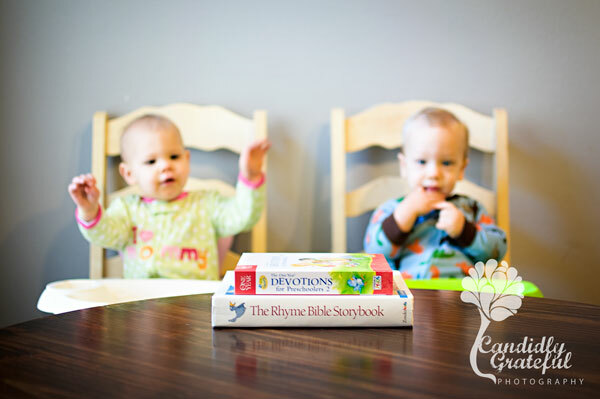 As I pull the 2 baby bible devotion books off the counter all eyes are glued on me and when I begin to bring them to the table clapping and cheering abound. I read the story as the babies wait in anticipation to see the pictures. 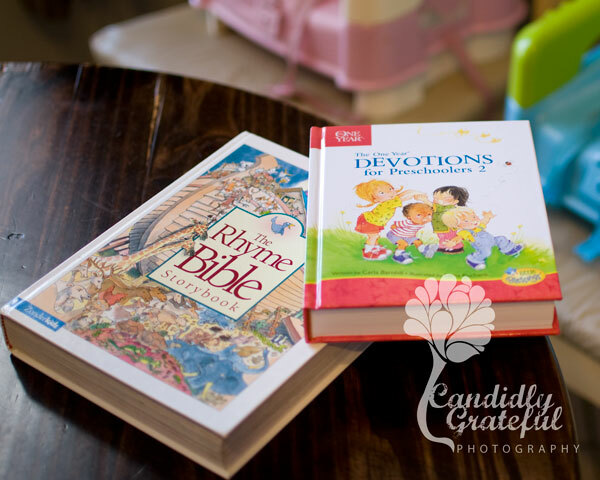 First we read a bible story then we read our daily devotion with the scripture and thought for the day. It amazes me most days how the Holy Spirit grips my heart and speaks to me through the Preschoolers daily devotion. I guess we’re never too old to go back to the basics. The babies love to worship so we sing our little hearts out and clap our hands and praise God. It’s so fun! Then we pray together. We’re still working on folding our hands so we don’t get distracted but we know God hears and loves our prayers anyways. This truly is the best part of my day. I love to see their excitement for the Word and worship. My babies know the name of Jesus and there isn’t any greater gift I could give them! In a world full of despair where bad things happen, scary things happen and sad things happen I get the great gift of introducing my children to the Hope of the World…Jesus! Before they know disappointment they’ll know the one they can run to when they’re disappointed, before they know sadness they will know the one who gathers all their tears, before they know they need forgiveness they will know the one who has forgiven them. My life knows no greater purpose then to show and tell my children about Jesus! Today I'm grateful I get to teach my children about Our Savior Jesus!